The name SACREd stands for St Austell Christian Resources and Education. The Trust was formed in 2010 by Churches Together in St Austell to serve churches of all denominations in the town and the surrounding area with books and other Christian resources and to offer a pastoral and prayer ministry to all who request it, whatever their faith or background. Mail order and online sales are processed from Wellingborough: for full details see the SP&S Contact Us page. We are a medium-sized shop stocking a wide range of popular titles, both English and American, including some academic titles. We have a growing children's department and also some secondhand books. We are always willing to research customer enquiries, and can obtain most Christian books published. We are committed to serve the public with excellence and the love of Christ, to provide literature and other resources to churches, ministers and individuals, to meet needs, bring wise counsel and to equip the saints to do the work of the ministry. 10% discount available to church members. The Sanctuary Cafe began with a vision in 2001 coming out of 'Coffee Pot', a group of women who met together for coffee, prayer and Bible study. Sue Eadon, who hosted the event, felt God wanted there to be a cafe run by Christians catering for the community of Lymm. Church Resources including altar supplies, wide range of candles and incense. Vestments and other clerical wear available to order. Alongside its extensive academic collection, the bookshop is a stockist for the Royal School of Church Music (RSCM) and members receive discounts on all RSCM titles. STP is now firmly re-established in its new home at Crewe, from which its publishing, mail order and used book sales operate. We sell an extensive range of Christian books with a dispensational perspective and there is a large second hand book department, including some scarce and rare volumes by 19th Century authors. Entry Updated: 3/10/2010 | Out of date? This is Scripture Union's Online Bookshop, offering the full range of Scripture Union's publications and subscriptions to dated products via the web and by phone. Founded in 1867, Scripture Union's aims are to make God's Good News known to children, young people and families and to encourage people to meet God regularly through Bible reading and prayer. In the shop we aim to stock books and gifts with Christ at the centre, carefully selected God honouring material. Our emphasis is on Scripture and the learning and declaration of God's word. We might not have very many church supplies in stock, but would be able to order most things for you. In the Café area, you will be able to refresh yourself with a nice drink and slice of homemade cake, or maybe choose to eat something a little more substantial from a simple, but wholesome menu. Entry Updated: 8/4/2010 | Out of date? For Christian books, coffee and tea, gifts, music and much more visit your local Christian Shop in Bourton-on-the-Water. We're a local ministry, bookshop and coffee bar in Newport, South Wales (UK). We exist to equip the local community with resources that will inspire and encourage people to live the victorious joy filled life of abundance that the word of God promises us! Support the Christian church by visiting us for a fantastic selection of Greeting Cards, new and second hand books, CDs, Icons, Prayer Cards, quality gifts, and much more! Shiloah Books is located at 23 Church Street, opposite Cromer Baptist Church, and stocks a range of bibles, commentaries, other Christian literature as well as greetings cards, calendars, diaries and gifts. Christian books not in stock can be ordered on request. There is also a selection of good quality second-hand books, both Christian and on a range of general subjects. 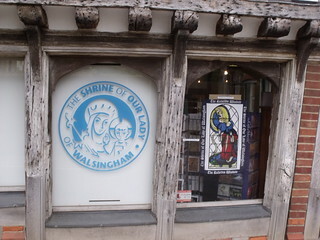 We are a small friendly Christian bookshop in a delightful East Anglia market town. We have a good range of up-to-date books for children (from picture books and puzzles to edgy teen fiction) and for adults. We have an excellent selection of Bibles, commentaries, biographies and devotional books. We supply Bible reading notes and can order any book you need with a quick turnaround. We also sell Christian greetings cards, gifts, music CDs and DVDs. You'll find a warm welcome when you drop in for a cup of tea, coffee or cold drink. For other Christian bookshops in the surrounding area please see the County Index » Kent. Bought two Christian Fish jewellery pins, one for myself and one for my fiance, lovely frienldy [sic] service, we are blessed to have a Christian bookshop in our little village when even most towns lack such Christian resources. An excellent service. They obtained secular books for me which bigger bookshops could not. Solacechristianbooks.co.uk is run by a specialist bookseller called Bookmark. To help and supply those who no longer have a Christian bookstore that can support and advise them. Bookstalls for Conferences and Events. Specialist supply to Churches, Dioceses, Colleges and other Christian organisations. Entry Updated: 4/4/2012 | Out of date? Established in 1971, we are a group of independently owned interdenominational Christian bookshops, serving Christians throughout Essex. Editor's Note: Sadly the Chelmsford shop ceased trading in January 2012: see the News & Notes section opposite for detailed reports. Southerden Books is a thriving Christian bookshop selling a large range of books, music, gifts and cards for both Christians and non-Christians. Students also get 10% OFF everything all year round with a valid NUS card both in store and online. When shopping online simply enter NUS07 as a discount code and we will take 10% OFF your payment. If you're visiting us in person, don't miss our Coffee Shop, serving freshly ground coffee, snacks, sandwiches and meals. Southport Christian Book Centre is an independent Christian Book Shop which has been trading for over 50 years. We sell a wide range of Christian books, Bibles, Christian Music and Christian DVDs, cards and gifts. We have a large selection of prayer books, assembly books and Bible studies. We offer a friendly and personal service and free postage on any orders we receive through the shop. We have a children's book room with an extensive selection of children's books with a play area to keep your little ones busy! We are able to order any book in print including American titles. Most orders will arrive within 48 hours. We offer a sale or return service to any Church wishing to have a selection of books on display for Alpha courses, or for a regular bookstall. We are also able to offer books for conferences, Church away days and ladies' and men's groups. If you would like any information about these services then do not hesitate to contact us. At the Southport Christian Book Centre we put Jesus at the centre of everything we do. We firmly believe that reading of Christian literature can and will enrich and encourage your faith. Christian books are essential in our spiritual journey to help us in our walk with our Lord and Saviour. We see our work as a ministry on the high street, a place where people can come and browse, enjoy the atmosphere and escape the hustle and bustle of the town centre. We are able to pray with people and be a listening ear to those who are having a bad day. We believe that the Bible is the inspired Word of God, it is his word and is all true. It is therefore a great privilege to be able to put Bibles into the hands of people. We are situated in Wesley Street which runs parallel with Chapel Street. Southport is a lovely Victorian seaside resort with a great selection of shops. If you do visit Southport please drop in to see us, you will be warmly greeted and even offered a cup of tea! Find many books which can help anyone in any situation from financial, healing, prayer, heaven, life after death and even all the hard questions about God. There are many authors with words that can lift your spirits and show you that with God all things are possible. Authors such as Joyce Meyer, R.T. Kendall, Rob Bell, Philip Yancy, John Bevere and many more. You can also find in the bookshop cards for almost every occasion, gifts for friends or loved ones, Christian music ranging from Hymns, contemporary or modern worship albums, DVDs of the latest Veggietales, Gaither worship or the hard hitting Noomas. We also have a section of jewellery. We are found opposite the Grammar School next to the Lighthouse Church. Entry Updated: 26/4/2012 | Out of date? Taken over by St Stephen the Great Bookshops, now ceased trading.